A controversial protest organized by Black Lives Matter Cambridge resulted in extensive media coverage and an open letter last week in the Cambridge Chronicle entitled, Fight for affordable housing in Cambridge is fight for black liberation. Unfortunately, the same publication rejected my comment so posting here and eager to share with City Councilors, various affordable housing committees, and Envision Cambridge — the $3.3M citywide planning process. My sense, unverified at this point and potentially unverifiable unless policy changes are made, is that foreign buyers and investor pools are removing affordable housing (which they define as $500K starter condos) faster then they can be added to the housing inventory. What can we learn from other cities about how to respond? Vancouver has imposed a new 15% real estate transfer tax on foreign buyers. Significantly, the tax does not come out of the sellers pocket or the developer’s proforma. As such, it essentially taps into Cambridge’s international appeal to raise funds to increase affordable housing. BOTTOMLINE: Add a 5th and potentially 6th bullet point to the list in the Cambridge Chronicle’s Guest Opinion? 5. 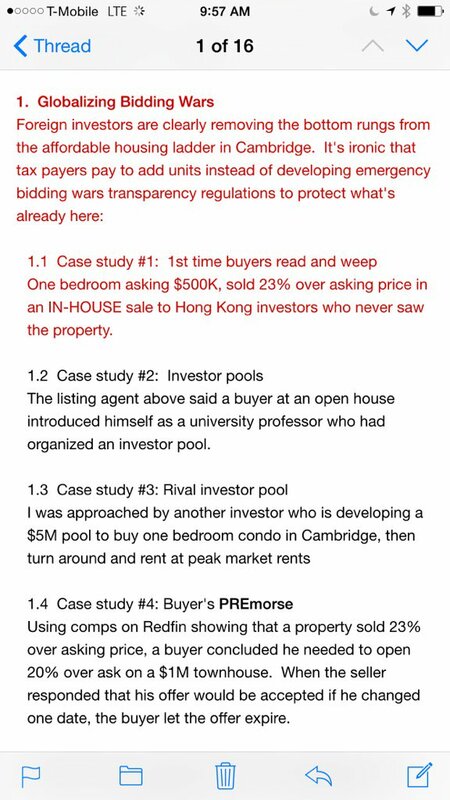 Impose a buyer tax on foreign buyers, similar to Vancouver where international investors pay 15% on top of the sales price; or Singapore’s model: any investor / non-owner occupant pays a tiered buyer tax. 6. To calm the current speuclative cycle, declare a two-year moratorium on #SpeculatorsWithoutBorders, too?